At only 13-years-old, Ian Chen has a pretty impressive resume! 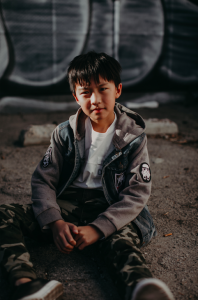 You’ve probably seen him as the very funny Evan Huang on ABC’s Fresh off the Boat. Now you can see Ian as Eugene in the highly anticipated movie Shazam! and next month in A Dog’s Journey. I got the chance to talk with Ian about his time on the Shazam! set, playing Evan Huang, and his love of aviation. Read on and enjoy! Shazam! is coming out very soon. How did you get involved in the project? 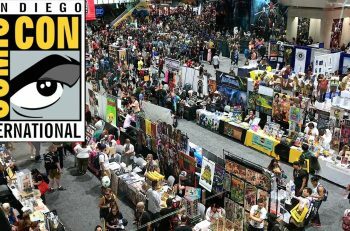 Are you a comic book fan? Have you read any of the Shazam! comics? I wasn’t much of a comic book fan before I got cast in Shazam!, but it has totally hooked me in. Can you tell us a little bit about your character, Eugene? Eugene Choi is a gamer and part of the Vasquez foster family. He doesn’t play those roleplay “baby” games, oh no… he plays the most action-packed (and sometimes bloodiest) games of them all. To keep his energy up the whole time, he guzzles down soda and sometimes plays from the break of dawn to the set of the sun. 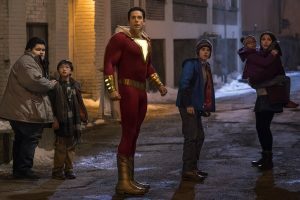 What was it like on the set of Shazam!? Any fun stories you can share with us? Working on Shazam! was an incredible experience. I think one thing that really brought the movie together is the bond between all the actors and just proves (because the kids are in the foster care system) that you don’t need to be blood-related to be a family. It’s all about your bond and love for each other. On-set, and off-set, we all had the 3 meals of the day together, sleepovers, field trips, etc. It was the most fun I’ve had on a set. I love Fresh Off The Boat and Evan is one of my favorite characters. What is your favorite part about playing Evan? Evan is a really interesting character to play, and it almost seems like there’s a new story for him every week. It’s like having two lives and getting to have amazing adventures with the character. What’s a trait that you have in common with Evan? Is there a trait Evan has that you wish you had? Interesting question. Evan and I definitely share a lot of differences. One difference is how attached Evan is to his parents and how upright he is. It’s quite interesting because in the beginning of filming FOTB we were quite similar, but in a way, we’ve drifted apart. I think Randall Park and Constance Wu are an incredibly funny duo. What is it like on set with them? They’re both incredible actors and very funny people. It’s always fun to see them improv at the end of scenes, they always crack me up. Another movie coming out soon that you are in, and I’m very excited about, is A Dog’s Journey. Can you tell us anything about your character? How many dogs did you meet during filming? I’m playing the younger version of Trent, who is best friends with CJ. He’s really excited about getting a dog, and so was I when I heard I would be working with them. It was fun to learn and see how the trainers keep the dogs in line, keep them energized, etc. Last, but not least, we like to ask everyone what they are nerdy about, whether it’s musicals, baseball, autobiographies or anything in between! What do you nerd out over? You know what, I’m a very big aviation “nerd.” In fact, I would like to be a commercial pilot when I grow up! You can now see Ian in Shazam! which is now playing in theaters! Make sure you follow him on Facebook, Twitter and Instagram!